Mixer Powder Plow mixers are similar to the paddle mixer but have actual plows positioned about the horizontal shaft to facilitate intense mixing. Plow powder mixers actually plow through and throw the product is specified directions to improve the mixing. Plow powder mixers are very efficient mixers and can usually achieve the required mixology of the product in very short time periods. Because they impart high energy not the mixing process heat rise can be a problem with heat sensitive products. 600 liter, 20 ft³, jacketed plow mixer. Interior chamber dimensions: 30" in Diameter; 48" in Length. Pressure rating: 75 psi @ 320° F. Equipped with a 14" OD / 10" ID flanged top center port, 12" OD / 8" ID top port, 3 plows on a 6" diameter shaft, two 2.5" OD threaded ports, and three side chamber interlocked access doors. 6 cu ft plow mixer, 20" ID x 57" L horizontal cylindrical jackted chamber with 6" ID top product port, rated to 45 psi @ 292 deg F, (2) 14-1/2" L x 12-1/2" W flip up, bolt down side access doors, has all stainless steel interior contact parts, with a 3" OD x 54" L horizontal shaft has (6) 3 pronged 5-1/2" L x 2-1/2" W mixing paddle blades. Has a 12" OD, 9" ID flanged bottom discharge port with (6) 1/2" bolts holes on 6-1/2" centers and a inner 7-1/2" L x 6" W flip down discharge cover with 19" floor clearence, 5 Hp chain to sprocket motor drive, saftey guarding and remote control panel. Littleford, Model M-5, 0.20 ft³, stainless steel mixer. Chamber dimensions: 8" diameter x 7" long. Equipped with (4) plows on 1" diameter shaft powered by a 3 Hp motor, top mounted 5¼" long x 2¾" wide bolt down access door with vents and 1½" NPT bottom discharge with flow valve and 9" ground clearance. Control panel with touch pad display, E-stop and digital temperature display. J H Day Turbulent mixer. Unit has approximately 45 cu ft working capacity. (350 gal) Similar in most respects to Littleford FKM1200 series plow mixer. It is a 3 plow design on heavy duty shaft. Includes one-10hp high sheer chopper agitator. Has 28"x14" rectangular access door with 10" diameter and 4" diameter piped feed charge ports. Includes liquid add tube. 9" diameter manual slide gate discharge. Includes two 8" diameter top – entering charge ports. Mild steel construction. Last used in chemical operation. Has heavy duty drive. Littleford Approx 600 Liter, 20 ft³ plow mixer with pounds of product per hour – depending on materials and application. Stainless steel contact parts. Chamber dimensions of: 36" OD / 32" ID x 48" Long. Equipped with 30" long x 26" wide x 16" deep top mounted product feed hopper with flip-up cover and safety grid and has (1) 11" OD / 6" ID flanged top port with (8)1/2" bolt holes on 4" centers and (2) 18" x 14" side access doors with safety shut-offs. Interior has (6) 10-1/2" long x 9-1/2" wide mixing plows with 2-1/2" wide x 1" thick spokes set on 4" OD shaft powered by 20 Hp main belt to motor drive with safety guarding and has (2) high speed side mounted choppers with 5 Hp motor drives. Center bottom 20" OD flanged discharge port with (12) 1" bolt holes on 5" centers and 12" x 12" swing door discharge valve with 24" ground clearence. Start / stop mixer, chopper and discharge controls with e-stop. Mounted on heavy duty (4) Leg base frame. 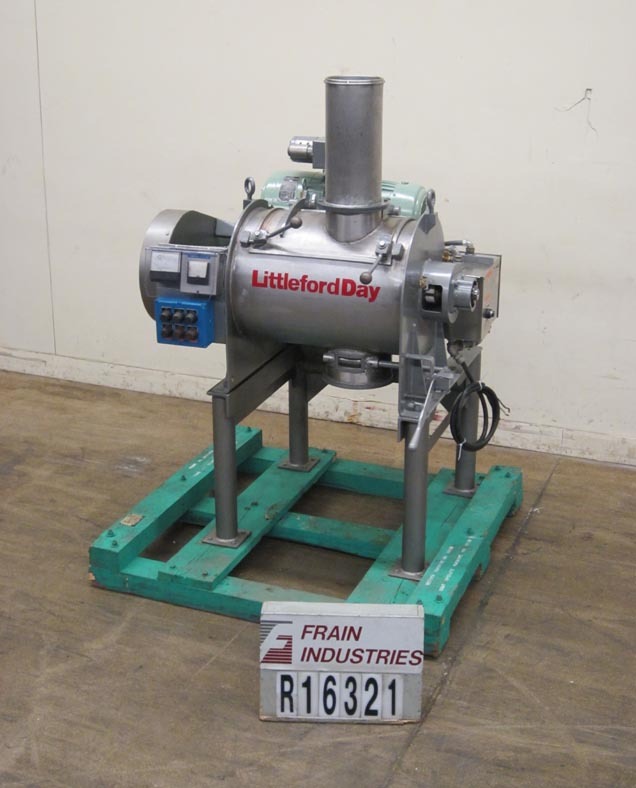 LIttleford, Model FM-130-D, 130 Liter ( 4.5 ft³), 304 stainless steel jacketed mixer with (2) 1¾" and (2) ¾" threaded jacket fittings. Chamber dimensions: 20" diameter x 25" long. Equipped with (4) plows on a 3½" diameter shaft powered by a 10 Hp motor, 6½" diameter (4) blade chopper with 10 Hp drive, 22" x 15" lift up cover with 11¾"OD/8"ID 6-bolt flange charge port and (1) 2"OD/½"ID tri-clamp style fitting. Center bottom flush valve with 14"OD/10"ID 6-bolt flange discharge with 48½" ground clearance. Includes start/stop for mixer and chopper, jog button and timer. Mounted on (4) tube legs with casters. 300 Liter (10.6 cu ft) stainless steel plow mixer. Has mix chamber internal dimensions of: 28" in Diameter x 39" in Length and is equipped with (4) plows and 1 chopper. 2 side access doors, 2 top ports, 6" diameter x 22 x 24", bottom discharge valve with 6" x 8" opening and shaft seals has port for liquid injection and is mounted on casters. OAD: 44" L x 72" W x 84" H.
Lodige, Model FM-130D,130 litre total drum volume with 25 to 90 litre working capacity ploughshare batch powder mixer with pounds of product per hour – depending on materials and application. Has 304 stainless steel contact parts. Chamber dimensions of: 19½" ID x 26½" Long with 12" x 20½" flip up, bolt down cover. Equipped with (4) bolt on mixing plows mounted on 3" OD shaft powered by 5.3 Hp motor to belt drive with safety cover. 6¼" x 4¾" center bottom flush valve discharge chute with 31" ground clearance and push button controls. Mounted on heavy duty base frame. Littleford 130 Liter (4.6 cu ft) jacketed stainless steel plow mixer. Vessel Dimensions: 27" Long x 20" Diameter. Jacket Specifications: MAWP 75psi @ 320° F. Equipped with 8" diameter x 9" high in feed chute, dual spray nozzles in feed, 3" mixing shaft with 3 plows, 5" diameter chopper blade, temperature probe, jacketed vessel with (4) 1" OD threaded jacket in/outlets, air end seals, manually operated 6" wide x 4.5" long discharge door with 30" ground clearance, Additionally features clamp down cover with interlocks, 10hp mixer drive, 10hp chopper drive, mixer/chopper start/stop controls. 100 Liter (3.5 cu ft), 304 stainless steel mixer. Unit has sanitary construction. Has 9-3/4" discharge 36" from floor. Includes chopper with 5 hp drive and air purge seals. Comes with 5 hp main drive with a servo motor that has a control panel variable speed, as well as a 5 hp drive for the chopper with seperate start stop switches. Mounted on casters. 130 Liter (4.6 cu ft) 316 stainless steel plow mixer. Equipped with a 20" diameter x 27"W S/S chamber with plows on a 3"diameter shaft. variable speed controls, timer, on /off, manual operated discharge port at 39"H.
Littleford FM300D, 300 liter, 79 gallon, 10.6 FT³, plow mixer. Interior vessel dimensions: 24" in Diameter; 40" in Length. Equipped with a 12" OD / 2" ID flanged top center inlet, 22" x 14" bolt down access door, 3" diameter shaft, five stainless steel plows, 7.5 hp drive, and a 26" x 20" discharge with 24" of ground clearance.